This deliberately provocative headline is of course not fully true: tax is clearly a tremendously important aspect of the Panama papers scandal, as it continues to roil governments and élites and their advisers, around the globe. But there are far too many commentators who seem to be putting this into a ‘tax’ pigeonhole. Many have dubbed this “the Panama tax avoidance scandal” (or variants of this) — which reflects a profound misunderstanding of what is going on. First, as an aside, we should probably banish this word ‘avoidance’ from the tax lexicon, because it’s so widely misused and misunderstood (it helps use words like ‘tax cheating’ or ‘escape’ instead, to keep you out of the thorny thickets of what’s legal or not.) 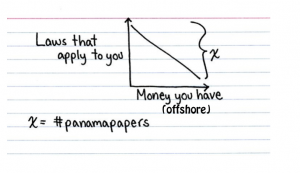 But more importantly for today’s blog, these commentators have erred when they put Panama into the ‘tax’ box. Tax is a subsidiary story. Note that the t-word is absent from that loose definition. And read her article in The Atlantic, if you haven’t already. It will tell you a lot about how the world actually works. So true. In fact it looks like criminality of all sorts. This link takes you to a blog with a similar, but quite different, analysis.